CookRite Infrared Cheese Melter Commercial Natural Gas Countertop ATCM-36 36"
This ATCM-36 natural gas 36" cheese melter with a sleek stainless steel exterior, cool to the touch knobs, and a one-piece broiler grid, easy to clean and easy to operate. A large capacity catch tray can also be removed for convenient cleaning. Perfect for delicate cooking and finishing. This cheese melter boasts two 21,500 BTU infra-red gas burners for fast results, while individual controls help you achieve the exact level of browning that you desire. 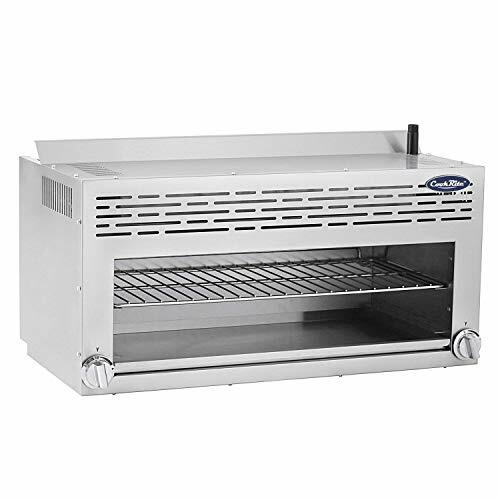 Allowing you to quickly melt cheese, heat chips, toast sandwiches, warm rolls and personal pizzas, browning a variety of foods for an ideal crispy taste or hold hot food until service! Gas Type:Natural Gas.Ship from USA. 2 burners independent manual control.This ATCM-36 36" cheese melter is perfect for delicate cooking and finishing. Durable stainless steel structure, corrosion-resistant and easy to clean. Simple and reasonable design, easy to manipulate and maintain. Two infra-red burners, independent manual controls to save energy and also help you achieve the exact level of browning that you desire. High efficient ceramic infrared burner, for quick and even heating.Mounting kits available to save kitchen space. View More In Commercial Broilers. If you have any questions about this product by Cook Rite, contact us by completing and submitting the form below. If you are looking for a specif part number, please include it with your message.